Few events so gripped Mumbai’s population in 2013 as those surrounding the residents of the Campa Cola Compound in Worli. The BMC’s plan to demolish the upper levels of seven buildings constructed in the 1980s reignited the ever-present controversies and concerns over Mumbai’s haphazard enforcement of development regulations, corrupt builders and the vulnerable position of everyday citizens caught between the two. Milind spent some of the most emotional days of his tenure in office working directly with the residents of Campa Cola in the days and nights leading up to the proposed demolition date. As protests mounted around the compound, MIlind went directly to the 140 families who would have been displaced following the demolition to hear their stories, one by one. Moved and enervated by what he heard on the ground, Milind took representatives from the Campa Cola Housing Society directly to the Chief Minister to plead their case, helping to bring the voices of the people most directly concerned in the fiasco to the forefront. He believed then as he does now that citizens of Mumbai should never be forced to pay for the old mistakes and illegalities propagated by a broken system. Speaking on behalf of Campa Cola’s residents was in itself a powerful political statement. Bringing those residents directly to the center of State power gave Milind the far more important and moving opportunity to put the principles of democracy into action. 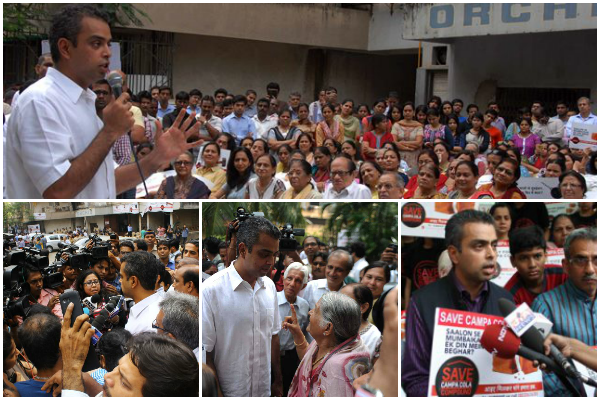 Together, the Campa Cola residents and Milind Deora secured a six-month stay on demolition. Milind continues to stand by those constituents affected by the proposed demolition plan and to help them continue their lives uninterrupted.